Sifu Ralph of WT Vancouver was invited by Sifu German to Calgary WT for the 2010 Spring Seminar from June 11-12th, with a bonus pre-seminar class on June 10th. 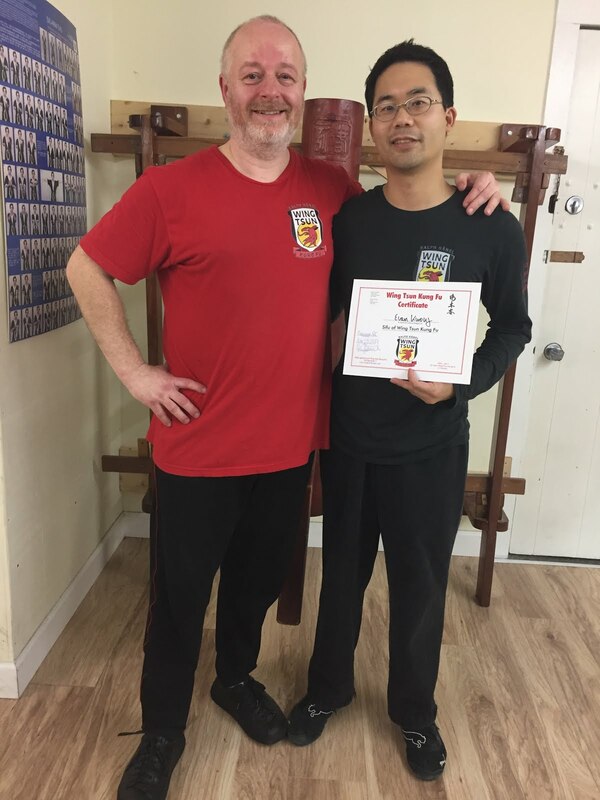 This seminar review is not only influenced by the teachings of Sifu Ralph, but also by training with two great WT Kung Fu Brothers, Sihings Tony and Edmond, who also flew in from Vancouver (pictured below). Before the first night, I met up with Tony and Edmond for a chat over some snacks and coffee/tea. We ordered the “Flatbread with 3 dips”, one of the dips being garlic-flavoured. Having garlic-breath was part of my secret plan of repelling any close-quarter attacks from any of my training partners that night. But alas, Edmond foiled my plan with his generosity: some refreshing chewing gum before we headed to class. These visits from WT Vancouver are never disappointing. Day 0, as I call the informal pre-seminar class, was followed by the official 2-day seminar. All chockfull of WT goodness. If we don’t understand the purpose of a drill, exercise, or whatever we are training, how can we understand the benefits? One example is understanding the Lat Sau program. As mentioned in a previous post, in Lat Sau, we start disconnected from our partner. Then we engage. But, sensitivity and pressure-reaction-training are not the only things we train in Lat Sau. We can learn many things in this program: positioning, footwork, timing, seeing openings, mobility, etc. So many things to think about. Some may not like the Lat Sau drills because they seem static, but it is likely as static as it was taught. If you find someone like Sifu Ralph who understands the purpose of Lat Sau, and knows the many intricate details within these drills, you have yourself an amazing dynamic training tool that will improve your WT. We are not just limited to thinking about Lat Sau in this manner. Why not analyze whatever exercise you are doing? Instructor shows a new drill to practice. Result: Students do something different. Instructor gives a reminder about drill both visually and verbally. Students do something different yet again. Instructor shows what NOT to do. Students train exactly that… what NOT to do! I think it has a lot to do with being comfortable with familiar surroundings, movements, and reactions. It is never easy to learn something new, especially when it comes to moving differently than how we are accustomed to. So how do we counteract this? After looking within, here are some ideas I came up with…maybe they will apply to others who find themselves in a similar situation. Be open to new ideas. You are still allowed to think about the “whats” and “whys” in the drill. Ask questions! There’s no one really watching you. You won’t make a fool of yourself by moving and wiggling your body or what-not. Just try it! A bit esoteric I know. But valid I think. We should not only want to learn the specific techniques and methods, but what lies beneath them. Look beneath to look beyond. Huh? Observe, think, wonder, imagine, discover. Is there something else that you can learn from the drill that is not visually obvious the first time? Hopefully, you find these suggestions helpful. Would love to hear your thoughts. Edmond’s nickname is “Wooden Arms”, but I think I felt “Cinder Blocks” on my neck. Tony (Leung) is the one of the most patient WT training partners I have had. Sifu Tony (Tam) was excited to share more of his thoughts and ideas again, even getting a bit more actively involved during the seminar; it is always very interesting to hear about another lineage of Wing Chun from Fatshan. Another spring, another seminar, another dinner, another step towards “becoming WT”! i chuckled at how 'longstreet' i think he is called, in the video,seems to watch Bruce Lee walk up, when he is supposed to be blind...he is finding a way to uncover more information?